Readers may remember that landowners at the southern end of the old racecourse buildings erected a large number of fences, had laid down a surfaced road and had attempted to divert the bridleway over the site. In most cases they had not applied for planning permission before carrying out the work and, when planning permission for the majority of the work was applied for, it was refused by the South Downs National Park Authority. 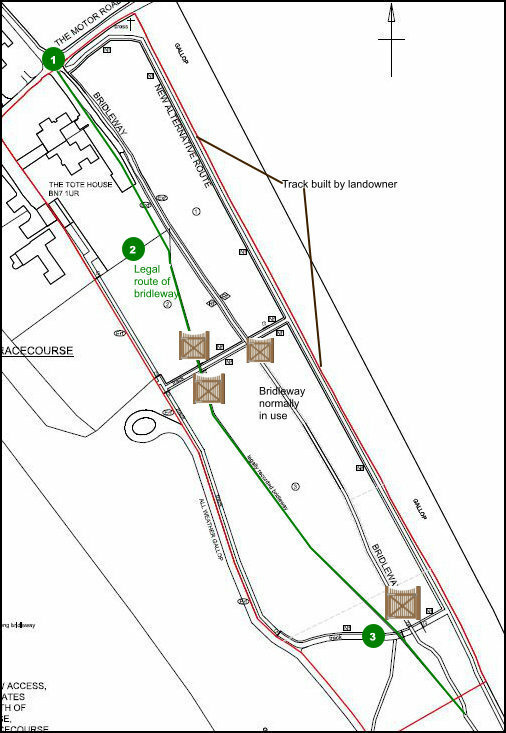 The application to divert the bridleway onto the surfaced road was refused by East Sussex County Council, which is responsible for rights of way. So you might be wondering why nothing much has changed, apart from the addition of yet more fencing.. These appeals will be decided by the Planning Inspectorate. There will not be a public enquiry. The Inspectorate will come to a decision based on documents sent in by the landowners and the National Park. Nothing will happen about the things covered by the appeals until the Planning Inspectorate has decided. An enforcement notice can also be appealed, but if it is not, or if the appeal fails, The National Park may prosecute offenders who do not comply with an Enforcement Notice. Those involved will be advised that the period for compliance has lapsed and they will be invited to state their intentions. If no agreement can be reached, they will be advised that non-compliance constitutes a criminal offence for which, if proven guilty through the courts, a fine of up to £20,000 can be imposed. So the whole thing may drag on for some time, although mounting costs to the landowners may affect their attitude. A proposal to divert the legal route of the bridleway to the route that has been used in recent years has apparently been made. East Sussex county council will be asking people for their views about this at some point. This proposal sounds reasonable provided that the bridleway is wide enough. Before the scrub was cut back the bridleway was only 3 metres wide. Given that the scrub had encroached on the route, only about 80cm was useable. The bridleway needs to be wider. You may also remember that some years ago another bridleway to the north east of the old racecourse buildings was enclosed, creating a narrow three metre wide track instead of the former route of up to 16 metres. The Open Spaces society made an application to restore the bridleway to its old route and width. East Sussex County Council has decided to make an order to do this but has not yet published the order. More details when they are available.